It has been a flurry of activity around here since my last update. As you can probably see in our various FieldCams, the hay has been baled and is presently stacked and awaiting pick-up. Since we did get a good application of chicken manure spread this past fall, we got about a 70% increase in weight of hay produced this season over last. The Fourth of July weekend was nice. I hope that you had a good one. Ours always starts in the morning with heading into Molalla for the annual parade. It is a family tradition. It is the typical rural, small town event that you see represented in movies. Local businesses and organizations enter floats. Rodeo princesses on horseback. Clowns on motorcycles. Marching bands. A group of bagpipers. Politicians. Several firetrucks and police vehicles from local communities. American flags everywhere and candy thrown to the kids. Fun And the weather was perfect this year. Although we took the day off from work, we did do yard work preparing for our evening barbecue. We have been spending most of the time outside watering, weeding and trellising tomatoes and beans. 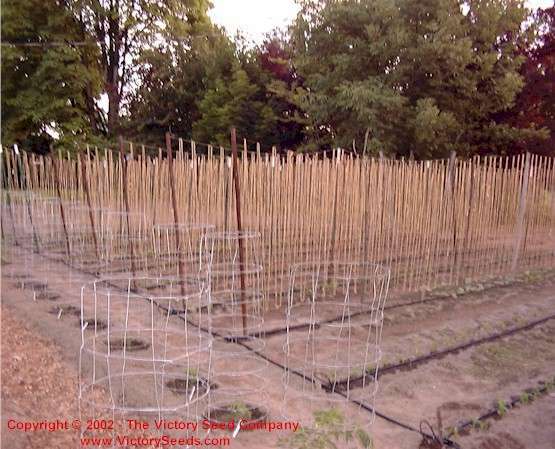 In regards to the beans, we made a great discovery over the winter of a new method for stringing up pole beans. My friend David Pendergrass of New Hope Seed sent me a link to a YouTube video made by a fellow name the “webcajun.” He showed how he used horticultural netting (aka crop netting) as the support for his beans. It was a revelation and changed our garden plans. It is basically the same structure that we have always used (as shown in the old picture above) – poles with supporting horizontal wires – but this promised to be inexpensive and more importantly, significantly less time consuming. Instead of manually weaving sisal twine up and down to form the vertical supports, horticultural netting to unrolled and fastened to the support structure. What use to take us hours and even days, took us minutes. If you are interested, we documented the task and published it as an educational video at – http://www.youtube.com/watch?v=YZzMrFjSVkA. On the subject of videos and YouTube, we finally got our YouTube Channel set up. It is located at http://www.youtube.com/VictorySeeds/. Please let folks know about it, subscribe to get notices of when we post new videos, and click on the like buttons if you find the videos helpful. When you do these things, you are actively participating in our seed variety preservation work. We have never had an advertising budget and have always relied on word-of-mouth recommendations and free exposure like YouTube. Thank you! Just another quick update. Last week the emphasis was on planting, watering and maintenance tasks. Most things are in and we are late this year. We had to adjust some planting schedules but we should be o.k. unless Mother Nature throws an early freeze this fall. 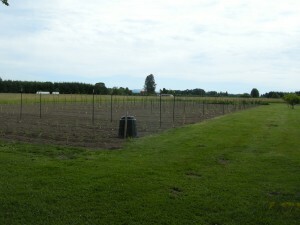 John spent Wednesday and Thursday setting posts for various trellis systems. 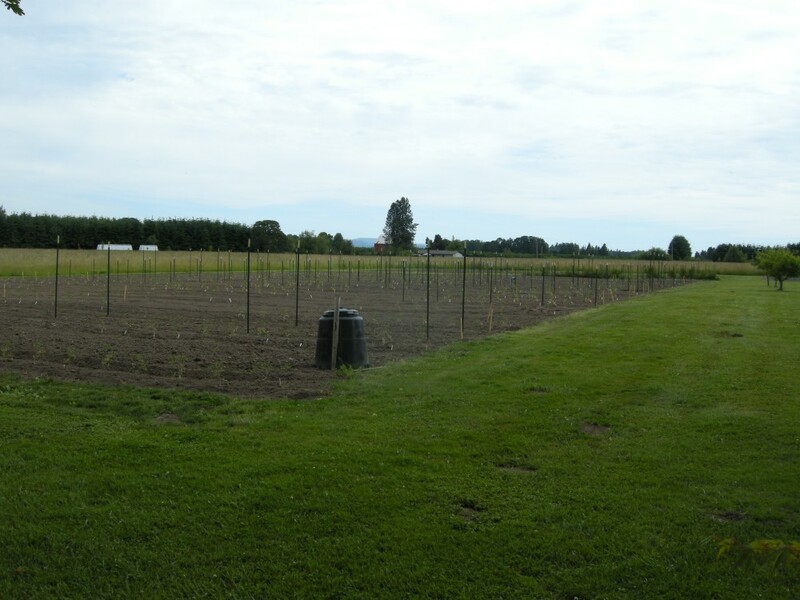 The majority of the posts are to accommodate the tomatoes. 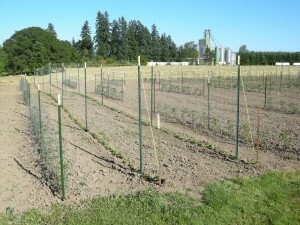 The taller posts are for the pole beans and pea varieties. This coming week, we will be working on the actual trellis installs. We primarily use the “Florida Weave” method for tomatoes and are experimenting with a new method for pole beans. More on that in a future blog post. As we are approaching the month of July, make sure that you are signed up for our newsletter. It will be sent out late this week. If you are not yet signed up, click here to join our list. Part of the reason we do what we do is to encourage and promote healthy living. I ran across the following article that I thought was interesting. Proof that gardening not only provides us with healthy food, but also is an activity that provides healthy exercise. By the way, if you have never heard of SparkPeople.com, check it out. It is an awesome (and free) community for helping people learn about, monitor, and maintain health. There are some really cool tools on there. I have no connection with them other than I found them in January while looking for a tool to keep track of my caloric intake. Their food tracker is accessible from both the web site as well as an app loaded on my smartphone.